Place the game board in the center of the play area. Place the season marker on the Aid from the King space (#1) of the Calendar Track and the year marker on the first space of the Year Track (with the Roman numeral "I"). Place the white dice and the "+2" tokens on their matching space on the game board. Place the King's Envoy marker on the #5 space of the Calendar Track. Put the goods cubes on their corresponding areas of the game board to act as the supply. During the game, if you gain or use goods, take them (or return them) to this supply. Your goods should always be visible to the other players at all times during the game. Choose your color and take all the pieces that match your color (three dice, three disc tokens, and 17 building tokens) and a province sheet. If there are pieces left over, return them to the box. Place your province sheet faceup in front of you, along with your dice and building tokens. Place one disc token of your color on the "0" space of the Soldiers Chart and one on the "0" space of the Scoring Track. Place one of each player's disc tokens on the Turn Order Chart in a random order. 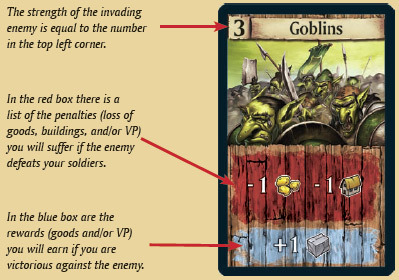 Divide the Enemies Cards into five small stacks, by the number on the backs. Shuffle each stack separately and randomly select one card from each stack without looking at them. Make one pile of five cards in numerical order (with the "I" card on top and the "V" card at the bottom) and place them facedown on the #8 space of the Calendar Track. This pile is the "Enemies Deck". Put the remaining 20 cards back in the box without looking at them. These cards will not be used this game. Each player strives to be the governor with the most Victory Points (VP) at the end of the fifth year. 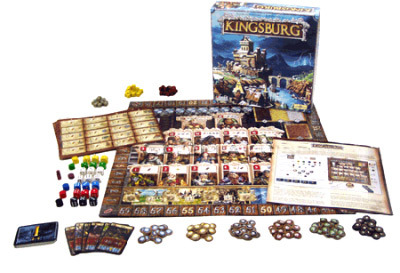 Players can gain points by influencing the King's advisors, constructing valuable buildings, and winning battles against the invading enemies. The game is played over five years. Each year is divided into eight phases, which always occur in the same order. The phases are shown on the Calendar Track. At the end of each phase, the calendar marker is moved to the next space, showing which phase is next. The King needs all of his governors to improve their provinces, so he will assist any governor that falls behind the rest. The player with the fewest constructed buildings (if there is a tie for fewest, the tied player with the least number of goods) rolls an additional white die during the spring season (spring only, not summer, autumn, or winter). If there is a tie for both fewest buildings and least goods, the King aids all tied players. In that case, each tied player receives any one good (of his or her choice), but no one rolls the extra white die. Note: During the very first phase of the first year no player has built or owns anything, so all players are tied: every player chooses and receives a single good (and no one will roll the white die). After determining which player (or players) needs the King's help (and assigning the white die or goods), proceed to the next phase. Example: In the first year, everyone chooses one good: Ann chooses a wood, Brian a stone, and Cindy and David both choose a gold. Example: It's the beginning of the third year. Ann owns six buildings and has no goods left, Brian has five buildings and two goods, Cindy has five buildings but no goods, and David owns six buildings and one good. Cindy has the least, so she takes a white die from the supply and will roll it with her other dice that spring. At the end of the spring season, she will return the die to the supply. 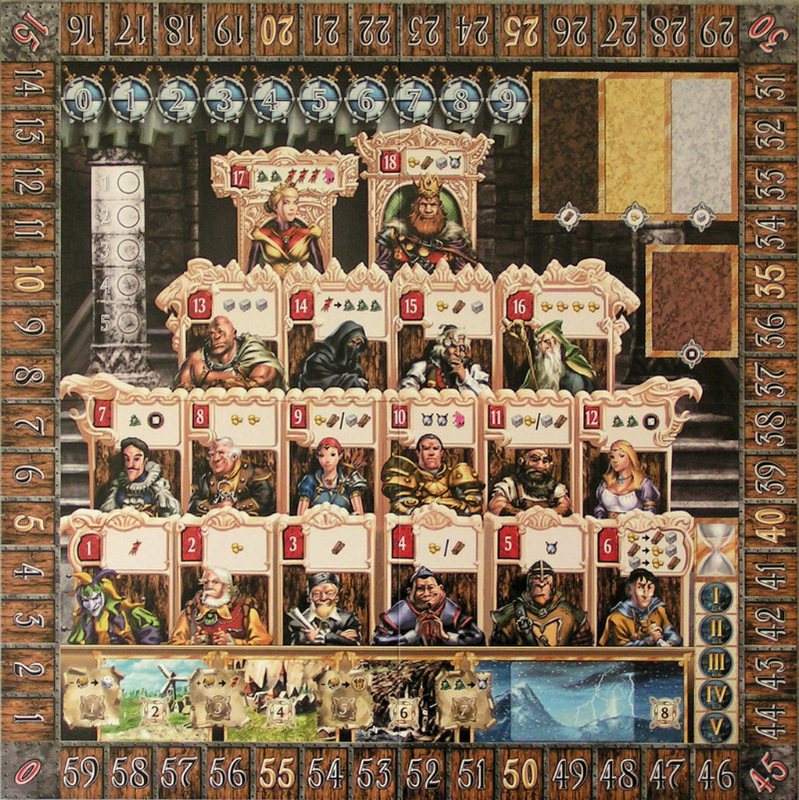 All players roll all their dice simultaneously. After you roll, you may use the benefits of the Statue and/or Chapel if you own one and choose to use it. These rerolls are used in the order shown on the current Turn Order Chart. Then, the positions of all the player tokens on the Turn Order Chart are adjusted for the season: each player adds up the value of all his or her dice (including any white dice rolled for this season). The player with the lowest total will be the new first player, with the other players acting in order of dice totals (so the player who rolled the highest total for this season will occupy the last position of the Turn Order Chart). If there is a tie for dice totals, then the tied player whose token was in the higher position during the previous season (or the random placement at the beginning of the game) keeps the higher position. After the turn order has been determined, proceed to the next step. In turn order, players now have the opportunity to influence one advisor or pass. After the last player in turn order has influenced an advisor or passed, the first player has an opportunity to influence a second advisor, and so on. Continue taking turns to influence advisors until you pass. Once you pass, you are done with this step, and your turn during this step will be skipped for the rest of the season. To influence an advisor, you must spend one or more of your dice. The total of the dice you spend must be exactly equal to the advisor value. You cannot partially spend dice! The full value of all dice must be used. When you influence an advisor, place your die or dice on that advisor's square on the board. Note: A single "+2" token can be added to a die (or dice) to increase the sum by exactly two points. You can hold an unlimited number of "+2" tokens, but you can only add one token per season to a die or dice group. You cannot influence an advisor if that advisor has already been influenced during the current season (by another player or by yourself). In other words, each space in the King's Court can have only one die (or dice group owned by a single player) on it. The only exception to this rule occurs when a player uses the King's Envoy. Note: You cannot influence an advisor using only a white die or dice and/or "+2" tokens; in other words, to influence an advisor, you must use at least one of your colored dice. You may use two white dice in the same dice group, but only if that group includes at least one colored die. If you have no colored dice left, or if you cannot legally place the dice you have left, you must pass. When all players have passed, proceed to the next step. Each advisor, in ascending order from #1 to #18, helps the player who influenced him or her by placing a die (or dice) on that advisor's space. If there are no dice on an advisor's space, just skip that advisor. Some advisors offer a choice of help (indicated by a slash between the two choices). If you influence one of these advisors, then you must choose which one (and only one) gift to receive. When all of the advisors have given their gifts, take your dice off the game board and return them to your supply. Any "+2" tokens or white dice used are returned to the general supply. Note: The supply is assumed to be unlimited. If at any time the supply should run out of any goods or tokens, simply keep track of the extra goods and tokens possessed by the players using any method you choose. 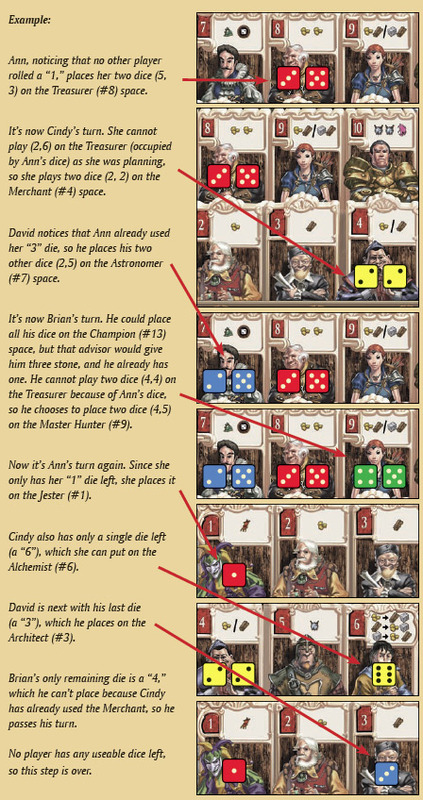 Example: The Jester awards one Victory Point to Ann: Ann moves her token ahead on the Scoring Track one space. There are no dice on the Squire, so he is ignored. The Architect donates one wood to David, who takes it from the supply. The Merchant lets Cindy choose whether she wants one gold or one wood. She already has a gold, so she goes for the wood. After ignoring the Sergeant (no dice on him), it's time to resolve the Alchemist. Cindy gives the wood she just acquired (from the Merchant) back to the supply and takes one gold and one stone. The Astronomer gives one "+2" token to David (he takes it from the supply) and one good of his choice. Her dice on the Treasurer allow Ann to take two gold from the supply; then Brian chooses one wood and one gold from the Master Hunter (he could have taken one wood and one stone instead). Since none of the remaining advisors have any dice on them, everyone takes back their dice and the current step is over. 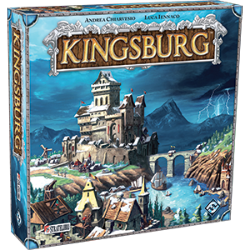 In turn order, each player has an opportunity to construct one building (Exception: the King's Envoy can allow you to perform a double build, see "Phase 5: The King's Envoy"). The cost to construct each building is shown on your province sheet. To construct a building, you must pay this cost back to the supply. You can only construct one building each season: first pay the building costs for the building you wish to construct, then place one of your building tokens on that building (you may find it convenient to cover the building costs with your token). If you construct a building that is worth Victory Points, move your token the appropriate number of spaces up the Scoring Track. Note: You must construct the buildings in each row from left to right. In other words, you can only construct a building if you already own all of the buildings in the same row to the left of the one you want to build. Of course, you can always begin a new row by constructing the building in the leftmost column. You can only have one of each building at a time. As long as you own a building, you can also use the special powers granted by that building. Each building's power is described in that building's space. Please note that you receive all the benefits of all buildings you have constructed, even if you construct new buildings in the same row. Some buildings, such as the Inn, have special powers that are used at the end of the productive season. See page 8 for additional notes about these powers. Your buildings can be destroyed during the winter season (see "Phase 8: Winter - The Battle"). If this happens, you must remove the building token from your province sheet, and you immediately lose the VP you received from that building (and must move your token on the Scoring Track to reflect the loss). After every player has had the chance to construct a single building or pass, proceed to the next phase. The King is pleased with his "best" governor (according to his judgment): the player with the most buildings is rewarded with one bonus VP. If there is a tie (for number of buildings), all tied players are awarded one VP. After the Scoring Track is adjusted, proceed to the next phase. 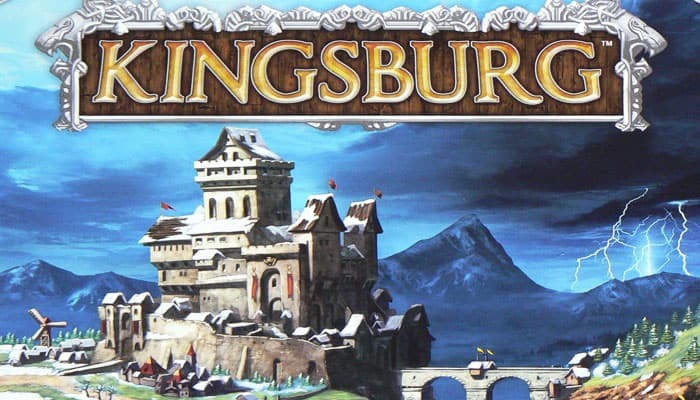 Summer is resolved in exactly the same way as "Phase 2: Spring" (Roll Dice and Adjust the Turn Order Chart, Influence the King's Advisors, Receive Help from the Advisors, and Construct Buildings). Then proceed to the next phase. Each summer, the King sends his most trusted Envoy to assist the governor that (in his judgment) has developed the least. 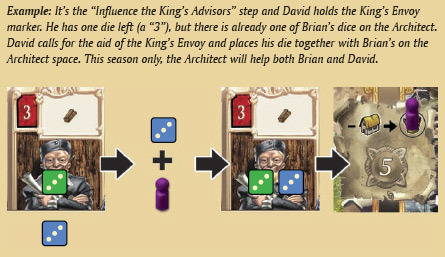 The player with the fewest buildings (in case of a tie, the tied player with the fewest goods) is awarded the King's Envoy marker. 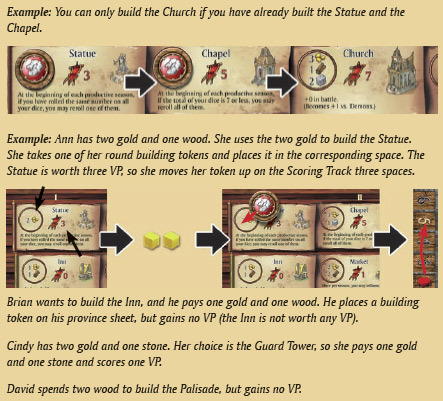 If there is a tie for buildings and goods, then no player receives the marker. Influence an advisor that has already been influenced (by yourself or another player). You must still use your influence dice to influence the advisor, following the normal rules. For that season only, the advisor will give gifts twice. Perform a double build during Step d of a productive season. You must still pay the full building costs for both buildings and follow all of the normal building rules (see Phase 2, Step d). You may only use the benefit of the King's Envoy once before you must return him to the matching calendar space. If you do not use the King's Envoy before the beginning of Phase 5 of the following year, the marker goes back to the supply and may be assigned again (even to the same player who possessed it the previous year). After assigning (or not) the King's Envoy marker, proceed to the next phase. Example: It's year two, in the "King's Envoy" phase. Ann owns five buildings and no goods, Brian has four buildings and two goods, Cindy owns four buildings and one good, and David has four buildings and no goods. David is assigned the King's Envoy marker. If Cindy, for instance, had no goods also, the King's Envoy would not have been assigned for the current year. Example: It's the "Construct Buildings" step and David holds the King's Envoy marker, one gold, and three wood. 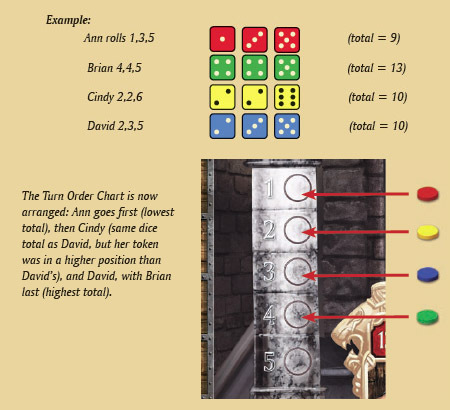 According to the rules, he is allowed to perform one single building action, but he calls on the King's Envoy for aid (and puts the marker back on the corresponding space on the game board) to perform two building actions instead of one. He builds both the Barricade and the Blacksmith in the same season. 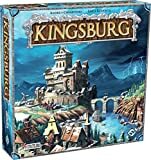 Autumn is resolved in exactly the same way as "Phase 2: Spring" (Roll Dice and Adjust the Turn Order Chart, Influence the King's Advisors, Receive Help from the Advisors, and Construct Buildings). Then proceed to the next phase. In turn order, each player now has an opportunity to hire soldiers. You may hire any number of soldiers at a cost of two goods (the same or different) per soldier. Move your token up one space on the Soldiers Chart for each soldier you hire. After all players have a chance to recruit soldiers, the phase ends. Winter is not a "productive season". In winter you must instead face an invading army of enemies. Turn over the top card from the Enemies Deck (on calendar space #8). This is the enemy that is invading the realm this year. Each governor must fight the enemy himself, with the help of additional soldiers sent by King Tritus. The first player on the Turn Order Chart must roll one die. The value of this die is the number of soldiers sent by the King to each governor. 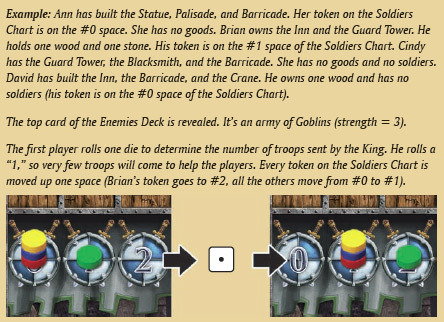 Every player advances his or her token on the Soldiers Chart a number of spaces equal to the value rolled on that die. To determine the result of your battle, compare your combat value to the current enemy strength. To determine your combat value, add (and/or subtract) any bonuses (or penalties) from buildings you have constructed to your score on the Soldiers Chart. If your combat value is higher than the enemy strength, you have won the battle and you receive the rewards listed on the Enemy Card. 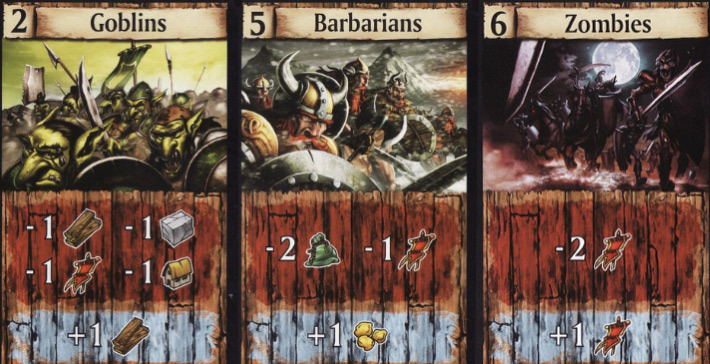 If your combat value is lower than the enemy strength, you have been defeated and must suffer the losses listed on the Enemy Card (gold, wood, stone, good of your choice, building, and VP). 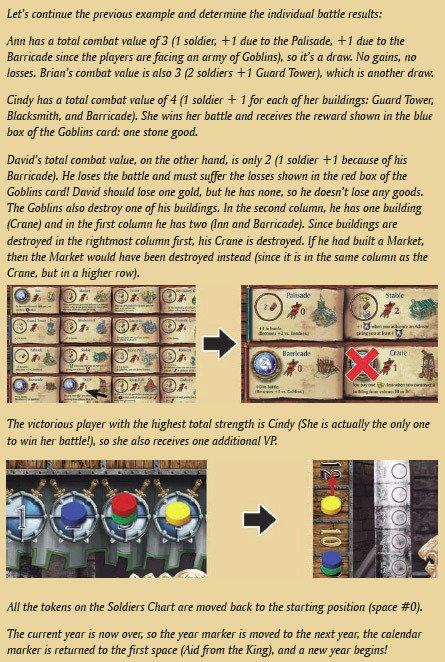 The player (or players) whose total combat value (King's Die + buildings + soldiers) is the highest receives one bonus VP, but only if he or she was also victorious in the battle. Note: The Soldier Chart is numbered from 1 to 9, but a player's total combat value can be higher than 9. So, for instance, if a player's total combat value (after bonuses and penalties due to his or her buildings) is 10 and another player's total combat value is 11, only the latter will be awarded the additional VP. Any goods you lose because of the battle must be returned to the supply. If you don't have enough goods to pay, you simply lose what you have and suffer no additional loss of goods. If one of your buildings is destroyed when you lose a battle, you must determine which building is destroyed. The destroyed building will always be in the rightmost column where you have at least one building. If you have more than one building in your rightmost column, the building closest to the top is the one that the enemies destroy. You must remove the corresponding building token and adjust the Scoring Track accordingly (from that point on, you won't benefit from the destroyed building's powers, unless you eventually rebuild the building). Destroyed buildings can be rebuilt in a future productive season as normal (paying the building cost, etc).. If you lose Victory Points when you are defeated in battle, you must move your token on the Scoring Track down the number of spaces shown. After the battles have been resolved for all players, return the Enemy Card to the box (even if all players lose the battle, the King's army will eventually chase the enemies away for you). Finally, all the soldiers go home (move all the tokens on the Soldiers Chart back to the "0" space). The phase and the year come to an end. After the winter season (Phase 8) is finished, the current year comes to an end. Move the marker on the Year Track down one space. If it is the end of the fifth year (year "V"), the game ends. Otherwise, a new year begins with Phase 1 again. Proceed through all eight phases every year. At the end of the fifth year, the player who has the most Victory Points is the winner! If there is a tie for Victory Points, the winner is the tied player with the most goods left. If there is still a tie, then the tied player with the most buildings wins. If buildings are also tied, then all tied players share the victory!